The USS Arizona Memorial is now part of the World War II Valor in the Pacific National Monument – Valor for short. The $56-million new visitor center was dedicated on December 7, 2010. Everyday the visitor center bookstore sponsors a featured book author signing for visitors. I am one of those authors. Since May 2012 I’ve visited Valor many times for book signings. 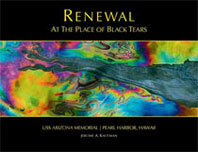 My book, Renewal At The Place of Black Tears, was released in Hawaii to coincide with the 50th Anniversary of the USS Arizona Memorial (1962-2012). As such, I’ve become an “ambassador ” for Valor. Everywhere I go I’m encouraging people visit this special place or revisit especially if they haven’t visited since the new visitor center was opened. When there I meet and talk with scores of the 3,000 to 4,000, young and old from around the world who visit daily. Everyone has a story. I love hearing theirs. There is a lot of “chicken skin” in those conversations (Hawaiian alternative to “goose bumps”). Many of the most interesting conversations begin with a simple question like, where are you from and what brings you here today. The responses are often rich stories and full of surprises. I encourage you to talk with other visitors. In between personal story conversations I’m answering general questions and giving directions to the theatre, hot dog stand, bathrooms and a host of other places. Sprinkled into those exchanges are the occasional comment/complaint or wish-I-knew about this that or the other thing. Since I’ve alway enjoyed learning how things work and can be improved, I’m continually thinking about how the visitor experience to Valor can be improved as I listen to the comments of others and make my own observations. Here are three such ideas. Free tour tickets for the USS Arizona are issued first-come first-served in two ways. The best on only way to get tickets at the time and date of your choosing is online reservations. There is a non-refundable $1.50 convenience fee per ticket charged at the time of booking. Tickets for a set time are also available on walk-up basis beginning at 7:00 AM. The allotment of tickets for the day often go quickly and can be gone before noon. Nearly everyday people are disappointed to discover that all tickets for the day are gone. Tour times are from 8:00 AM to 3:00 PM. The tour includes a 23-minute movie and a boat ride to and from the Memorial. Each tour lasts 75 minutes. Additionally private group tour organizers secure tickets for their customers. Visitors are not allow to bring bags or packs through the security check point. Wallets are allowed. Teachers and active duty and retired military are entitled to a 10% discount in the bookstore with proper identification. Many people, particularly women and teachers, are disappointed everyday when they realize they don’t have the necessary identification, credit/debt cards or cash with them to buy items at the gift shop the way they want to. Identification is required for credit card purchases. There are two ATMs available. Everyone that visits the Memorial knows that there was an important battle at Pearl Harbor. What many, if not most, people miss is the history of Pearl Harbor since the battle. For the past five decades Pearl Harbor has been a place of healing and renewal for many civilians, sailors, marines and soldiers. Since 1991 Pearl Harbor’s history has included acts of reconciliation as former enemy combats have met, made peace each other and sometimes established friendships. 2012 marks the 50th Anniversary of the USS Arizona Memorial as it transitions from primarily a battle site memorial to a place dedicated to peace, or as the National Park Service says, From Engagement to Peace. I believe having some understanding of this in advance of a visit as shared in the book Renewal at The Place of Black Tears would greatly enhance the experience to this powerful place.